In this installment of our Modern Business Profile series, we learn more about Credit River Dental and how they’ve set them apart from the competition along with how they’ve overcome challenges to become one of the top businesses in their competitive marketplace. How long has Credit River Dental been in business for? It would have to be that you are creating something that you had envisioned. Of course there are going to be growing pains but that is just one of the many accepted challenges that come with being your own boss. 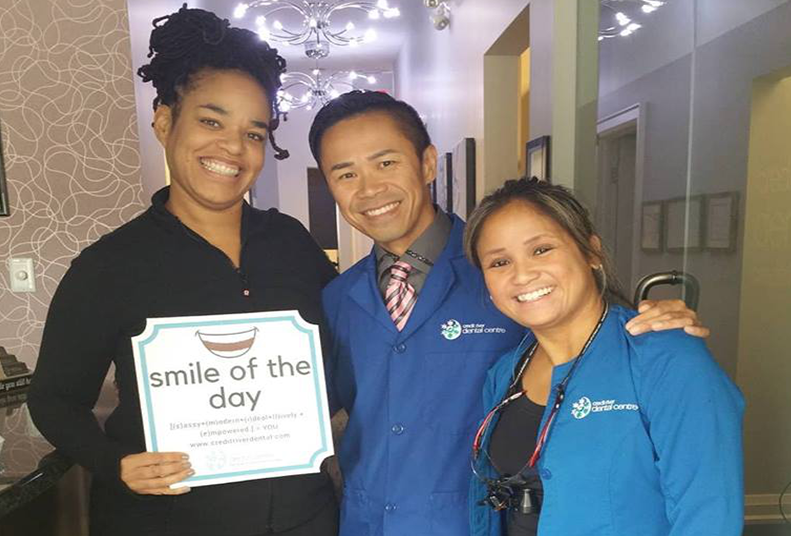 Everyone comes from different backgrounds and different experiences and dental patients are no different. They have experiences at previous dental offices, good and bad. If they were bad, you have to be the one to convince them and eventually show them that things will be different. In a good way obviously. If their experiences were good then you have to make sure that you surpass their expectations. Be sincere and never ever disparage another dentists’ work because you just do not know the circumstance in which the work was done. Be as educated as you can possibly be and do not be afraid to refer out to a specialist what you do not feel comfortable treating. It’s better for the patient and your practice. Always remember that because we are dealing with people and biology, perfection is never a realistic goal but always, always aim for excellence. Not just great staff, great people. Why did you pick Mississauga to set up shop? I grew up and went to school in Toronto and I worked for a number of years in Hamilton so the Golden Horseshoe has always been home for me. Family and friends have always been very important to me so I didn’t want to have to travel too far to be able to see them on a regular basis. Mississauga is a great in between, Port Credit is a beautiful area and as luck would have it my wife and her family have lived here for most of their lives. Have integrity and take great care of your clients. What trends do you predict for your industry over the next few years? As the population ages I think there are 2 main areas that will come to the forefront. Firstly I believe that patients will be made more aware of the connection between oral and systemic health especially as the population ages. Let’s take sleep apnea for example. Our office screens everyone for sleep apnea which in my mind is one of the most under diagnosed conditions in our society. The oral health care provider really is the first line of defense with sleep apnea since we routinely spend 30-60 minutes looking down your airway. The link between gum disease and a number of autoimmune conditions has been well documented for at least a decade now. Secondly, everyone wants that fountain of youth as we get older and we have great options for providing that whether it be in the form of porcelain veneers or brightening up your smile with an in office whitening session. Maybe you want to straighten those crowded teeth you have been thinking about for many years but were just too busy focusing on raising your kids and your family and neglected taking care of yourself. We have many many adult orthodontic patients because it’s not just about esthetics anymore but also about hygiene and function. 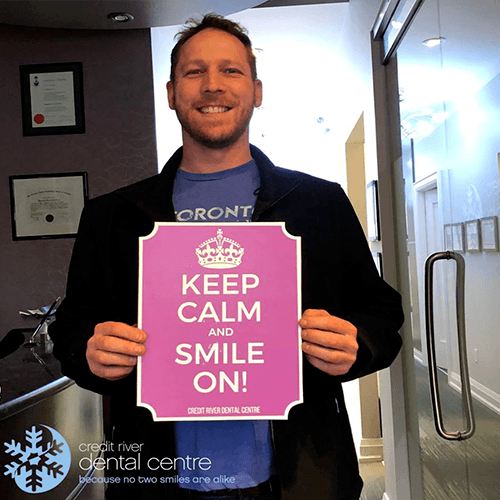 In a crowded marketplace, how does Credit River Dental set itself apart? Dentistry has evolved and is ever so changing. It is important to recognize that keeping current and updated will allow you to give the best care possible to your patients. 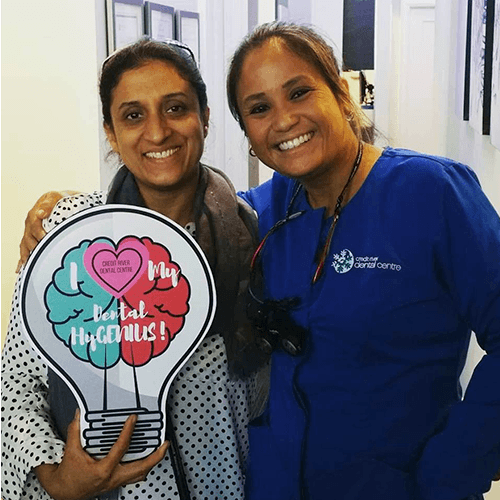 Our team at Credit River Dental Centre prides ourselves on our commitment to our valued patients which is driven by our passion about the field of dentistry. It isn’t about just teeth anymore, it’s about providing custom comprehensive care. From the moment you contact our office, our team will ensure we look after any concerns or questions you may have about your oral health. 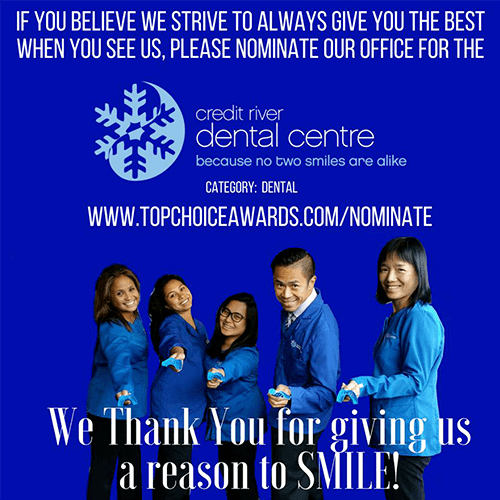 From the moment you step into our office, you become part of our Credit River Dental Centre Family and our team ensures that we always give you a reason to smile! We pride ourselves on our ability to work well together as a team and we love hearing patients tell us the office has a warm family environment. 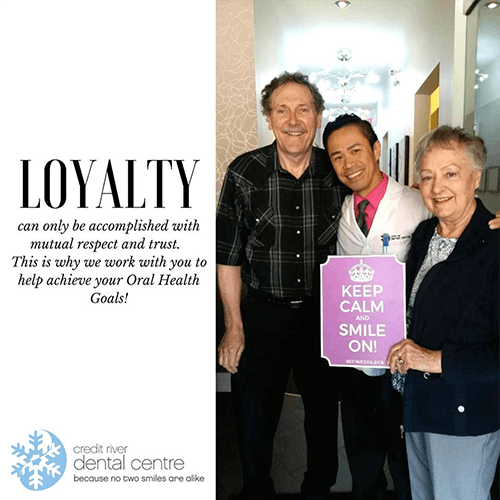 Custom comprehensive care is what we’re all about because after all “No Two Smiles Are Alike!” and we invite you and your family to become part of the Credit River Dental Family.